The sacred region of Besyul Pemakod, known as “The Hidden Land,” is located on a secluded plateau in the Himalayan mountains. This exquisite, ancient land was once part of Tibet. But today, the northern portion (known as Upper Pemakod) is annexed by China, and the southern portion (known as Lower Pemakod) is annexed by India. Upper Pemakod is the main subject of Ian Baker's book The Heart of the World. Tulku Orgyen P'huntsok's retreat land and Deden Tashi Choeling Temple are located in Lower Pemakod, in Arunachal Pradesh, India. Untouched by outside influences, this sacred region remains spiritually pristine as in the time of Guru Padmasambhava, who practiced extensively in many caves there and blessed the land with the concealment of many sacred treasures. It is therefore one of the most sacred and rare places in today's world for spiritual practitioners to meditate and practice. The phrase “hidden land” is significant and has three meanings in the context of Pemakod. The first, secret meaning of the phrase implies the ultimate nature of this mind: the infinite enlightened qualities of Buddhas are, by nature, hidden, or beyond this dualistic mind from the beginning. Therefore, the merit of any Dharma practice one performs in this hidden land will be tremendously effective for revealing the hidden, inherently pure nature of one's mind. The second, inner meaning of this phrase implies that this is a place where maha yogis and yoginis gathered to practice secret tantras and ganachakras. Thus, except to such highly realized beings, this place is hidden. 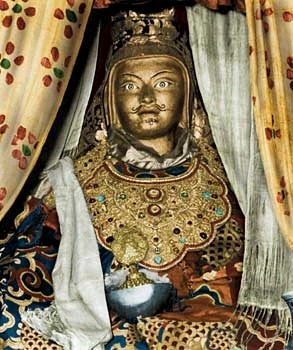 The third, outer meaning of this phrase refers to Guru Padmasambhava, who blessed this land with numerous treasures, setting it aside in this degenerate time for only those fortunate beings who are karmically connected to it, ordaining that it remain hidden “the treasures and the blessings” unavailable to others. “In this hidden land, all mountains are like blooming flowers. All rivers spontaneously recite mantras and flow with nectar; rainbows are arched on trees and bushes. All the oath-bound protectors watch closely and protect true practitioners and punish those who merely pretend to be. Those who practice sincerely will attain enlightenment in this lifetime. Pure samadhi will spontaneously arise just by being in this land. In fact, just as Guru Padmasambhava stated, the uniqueness of this place is to, to this day, by such phenomena as the clear memories many children born here have of their past lives and the visions and experiences that practitioners and pilgrims continue to have here. The geography of Pemakod resembles the dakini Vajravarahi, lying on her back. Various areas of this hidden land are described in terms of the different parts of Vajravarahi's body, mainly in five chakras. The particular part of Pemakod in which Tulku Orgyen's retreat land and Zangdok Palri Temple are located is considered the secret chakra of Vajravarahi's body. This area contains numerous minor as well as four major holy places. The first of these is Dharmakaya Amitabha's holy place, Padma Shri; another is Samboghakaya Avalokiteshvara's holy place, Riwo Tala; a third site is Nirmanakaya Guru Padmasambhava's holy place, Citta Puri; and the fourth holy site, Devi Kota, is centered between the other three and embodies the blessings of all three. Devi Kota is only a few miles away from Tulku Orgyen's retreat land, which he visits every year in December.